NIA CHARLESTOWN NEVIS (September 17, 2014) –Rol-J Williams, the Junior Minister of Tourism on Nevis, will vie for the Caribbean Tourism Organisation’s coveted title of Caribbean Junior Tourism Minister at the 2014 Tourism Youth Conference on September 19, 2014, in St. Thomas, United States Virgin Islands. Williams, who along with outgoing Caribbean Junior Tourism Minister Neila Jones accompanied by Ministry of Tourism Officials and Chaperon left Nevis on September 17, 2014 but not before a meeting with Deputy Premier and Minister of Tourism on Nevis Hon. Mark Brantley who gave the participants the Nevis Island Administration’s blessing. “We look forward to these young tourism ambassadors going off to the United States Virgin Islands in St. Thomas and representing us with aplomb…I wish them all the very best as they continue to represent the island,” he said. Meantime, Mr. Brantley also gave some insight into the contest. “Nevis will defend its championship in the 2014 regional Tourism Youth Congress which will be hosted by the Caribbean Tourism Organisation (CTO) as one of the activities for the upcoming State of the Industry Conference (SOTIC) from September 17th to 20th, 2014, in St. Thomas USVI. 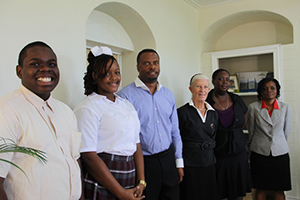 “Fourteen year-old Rol-J Williams, Nevis’ reigning Junior Minister of Tourism and a fourth form student of the Gingerland Secondary School will represent Nevis at the upcoming event. The Youth Congress is structured to mirror a CTO Board of Directors meeting. Participants have a choice of two topics to choose from. In the first round of the event each participant will come prepared to present their views on one of the topics,” he said. According to Mr. Brantley, the topics for the 2014 event would be “Accessible Tourism” and “Experimental Tourism” and a mystery topic will be given to the participants in the second round of the contest. The contest will be held on September 19. In 2013, Neila Jones, a former student of the Gingerland Secondary School won the title of Junior Minister of Tourism on Nevis, then went on to capture the title of Caribbean Junior Minister of Tourism. She will attend this year’s contest and chair the programme. 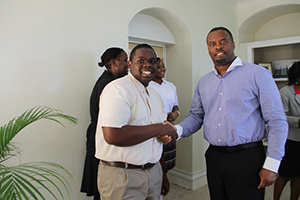 The local Tourism Youth Congress was held in May 2014 and was sponsored by The Bank of Nevis Ltd. Cape Air partnered with the Ministry of Tourism to support travel to the USVI. The Nevis team who travelled to St. Thomas were Vanessa Webbe, Tourism Education Office in the Ministry of Tourism; Philicia Walters, Rol-J’s teacher and Chaperone; Deborah Lellouch, Independent Contract Tourism Teacher and Rol-J’s mother Janice Williams. Jones also gave a brief response. She congratulated her colleague on his success and wished him well at the regional contest. “I would first like to thank the Ministry of Tourism for hosting the local Youth Congress and I would like to congratulate Mr. Rol-J Williams for winning the local Youth Congress. I would like to wish him best of luck in going to St. Thomas to represent the island of Nevis and I hope that he will be able to bring back the championship here. I’m also looking forward to hosting the event in St. Thomas. However, I would be very saddened at the same time because I will be there to give up my title of being the Caribbean Junior Minister of Tourism. “It was a wonderful experience. I gained a lot. I went to Barbados to participate in a television show called “Tourism the Y-Factor.” I got the opportunity to board a cruise ship to give best wishes to the cruise captain and I also got the opportunity to inspire many youth and I hope Mr. Williams will do the same as he goes out to represent Nevis,” she said.